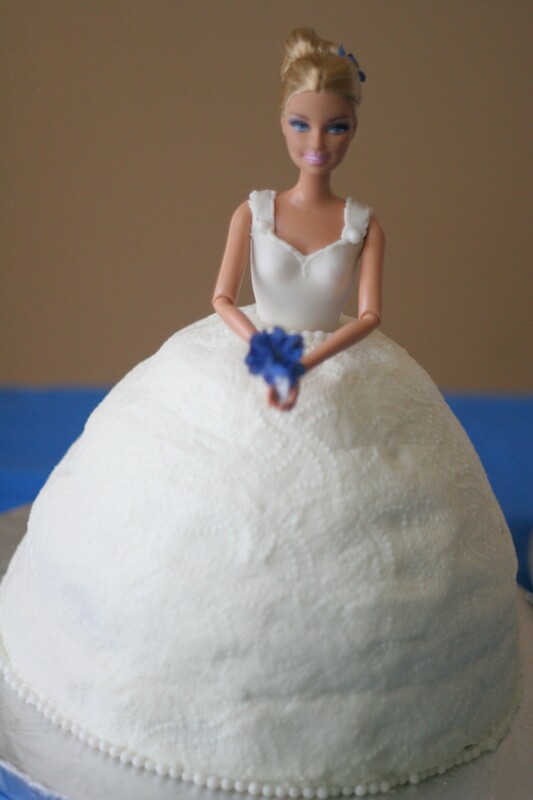 Last weekend we had a bridal shower for my sister. I had some help making the food and I was off the hook for drinks, but I a little problem. I had to transport food for about twenty-five people over an hour away. No hot dishes or large meat plates and definitely no ice cream for dessert. In a way, the distance immediately helped me hone down my choices of what to cook. The afternoon before the shower I began to cook. I settled on my favorite cauliflower fritters with lime-yogurt sauce and a very new favorite wild rice salad. I prepared three types of meringues for a self-service meringue bar (more on that in another post), but I wanted one more main course item…with carrots. Right now we have a motley crew of carrots in our garden from Chantenay and Babette to Round French Market so when I received a bag of maybe two pounds of lovely baby carrots from Mariquita Farm, I reserved them for the shower. I had been eyeing an old Gourmet magazine recipe for Israeli couscous with squash that made use of preserved lemon. I decided to ditch the roasted squash and substitute quickly blanched, unpeeled baby carrots. In addition, I preserved some Meyer Lemons about two months ago and had yet to use them. The dish had begun to evolve. I also had on hand a package of salty Moroccan olives from a Middle Eastern Market near my house so I decided to riff Moroccan despite the “Israeli” part of the couscous name. That being said, I actually imagined this salad with one more little change which was the addition of maghrabia/mograbiah (essentially humongous Israeli couscous) just to add a little contrast, but I must have used the last of that or it is hiding behind one of my twenty bags of whole grain flours. So how did it turn out? Tantalizing. The preserved sour lemons and olives packed a salty enough punch that I added absolutely no additional salt to the couscous. The sautéed onions and toasted pine nuts made this dish taste fantastically savory despite its vegan status. Add the barely cooked baby carrots and a handful of raisins, and the sweet flavors rounded out the dish. I cannot gush enough about how much I liked this salad and the only thing holding me back from making another batch is a trip to the store for more Israeli couscous. Oh, you meant how did the shower turn out? As a result of the great efforts of my aunts and youngest sister, it was wonderful and low-key. We lounged out in the warm Davis sunshine, which was very welcome after a week of fog in San Francisco, and celebrated sister number three’s impending wedding (read: a lot of racy lingerie). I am really looking forward to it. 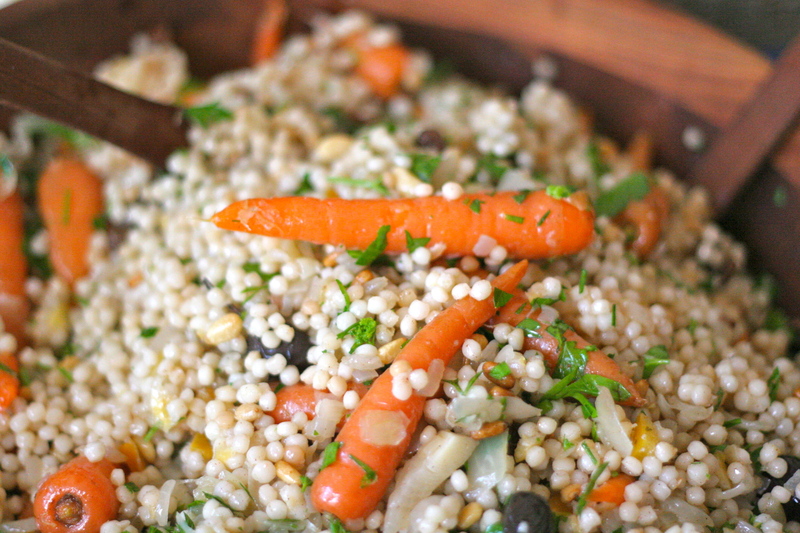 More Israeli couscous with carrots, Moroccan olives, and preserved lemons. Bring a pot of salted water to boil and prepare a medium bowl of ice water on the side. 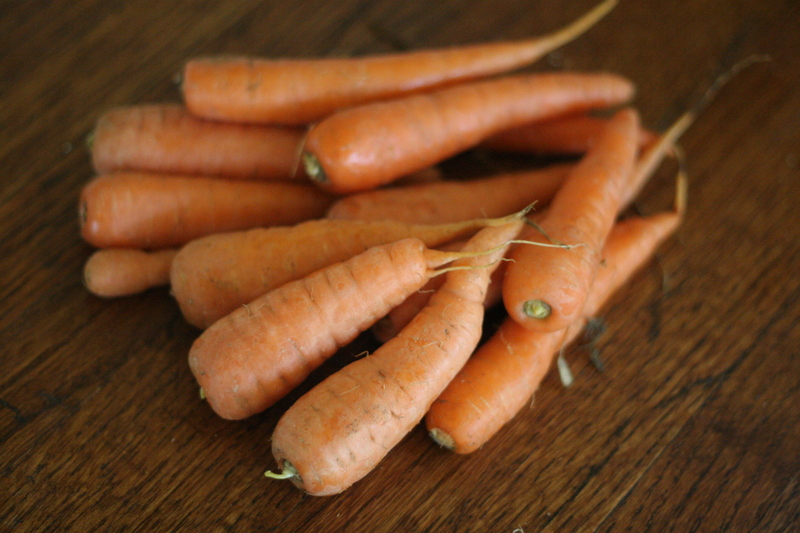 Boil the baby carrots until they are just cooked on the outside, but still maintain a slight firmness inside. No mush here. Fish them out of the boiling water and plunge into the ice water to cease cooking. Set aside. Keep the water to cook the couscous or, if you do not want any tinge of orange on the couscous, boil another pot of salted water and add the cinnamon stick. When boiling, add the couscous until it is al dente, like regular pasta. Drain without rinsing and set the couscous aside. Meanwhile, saute the onions in the olive oil until they are past translucent, and just beginning to turn golden, about ten minutes on medium heat. Add the olives and give them a turn in the pan for another minute and let cool for a couple of minutes until just warm. 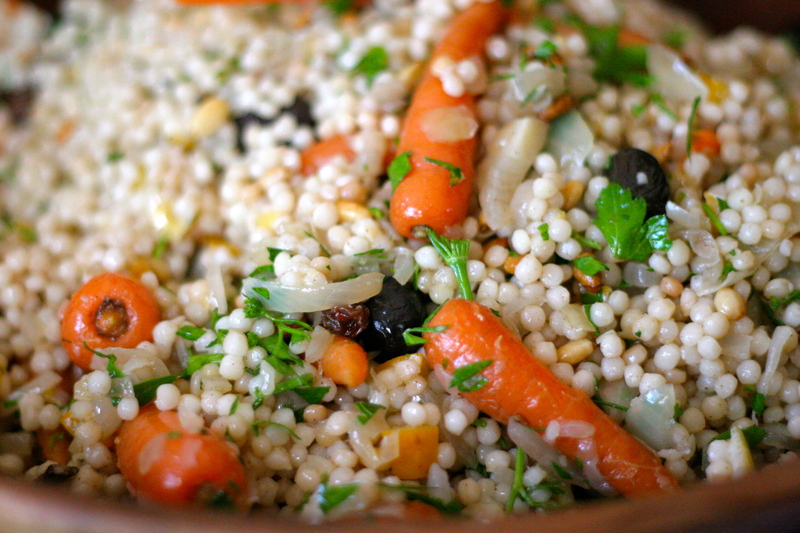 Combine the onion-olive mixture with the couscous and carrots. Add the chopped preserved lemon, raisins, parsley, cinnamon, and allspice. Gently mix together and add the pine nuts for one or two more turns. Serve. *Notes: If you want to make this the day before, wait until serving before adding the chopped parsley and pine nuts. Also, if you add in the moghrabia, it will take longer to cook than the Israeli couscous, so cook it separately. 1 very clean 1-quart mason jar. Slice about 8 medium-small lemons into eighths lengthwise, you may need more. Layer wedges of the lemons with the salt, pressing down with the back of a clean wooden spoon as you go. I tend to do about 6-8 wedges on each layer and then about 2-3 teaspoons of salt in between them. Do this until you fill the jar. Cover and set aside in a cool spot for 4 days. The salt draws the juice out until it almost covers the lemons. Push down the lemons once more and if they are not covered, juice some of the remaining lemons and add the juice to the top until they are. Out the lid back on the jar and leave alone for another 3 weeks in a cool spot. Enjoy. They will keep for at least 6 months in a cool spot. This entry was posted in Carrots, Dinner, Lunch, Pasta, Salad, Vegan and tagged baby carrot pasta salad, carrot olive preserved lemon couscous, Do-ahead shower dishes, Israeli couscous preserved lemon, pinenut carrot middle eastern couscous. Bookmark the permalink. The food was amazing! I can’t wait to have some more preserved lemons. Arg… lacking Kosher salt. Well, domani it is! How are they coming along? 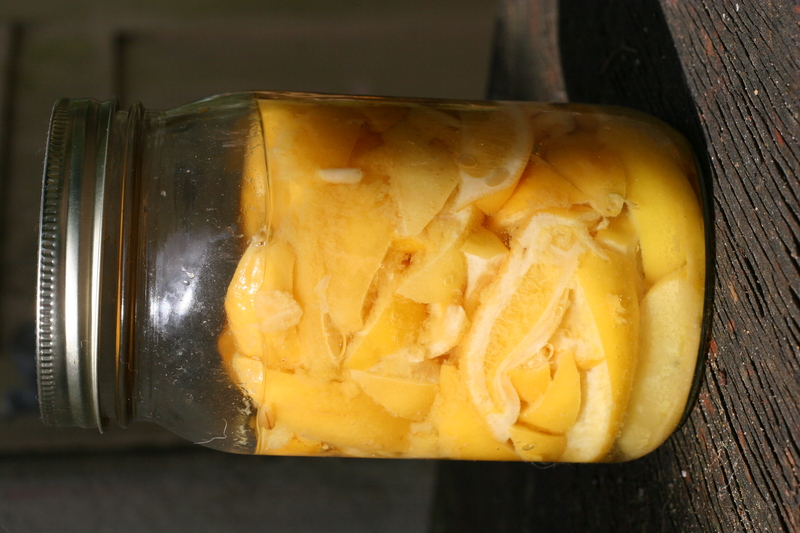 I just added the extra lemon juice to my next batch of preserved lemons and cannot wait for them to be ready.